Swallow Chaucer Hotel - Hotel Hotel 63 Ivy Lane, Canterbury CT1 1TU. Swallow Chaucer Hotel - Hotel, 63 Ivy Lane, Canterbury CT1 1TU. Originally a private Georgian house, Chaucer Hotel stands opposite Canterbury's ancient city walls and is a 5-minute walk from the city centre. It is close to all the city's sights. The charming hotel has an award-winning restaurant and a rich history. The Chaucer is ideal for a meeting, conference, or as a base from which to tour the beautiful 'Garden of England'. Enjoy exceptional service and a friendly atmosphere. For meals, the on-site 63 Ivy Lane offers traditional English cuisine with a French influence. Alternatively, the patio terrace and Pilgrims bar is open from 10:00 daily and serves a brasserie-style menu. 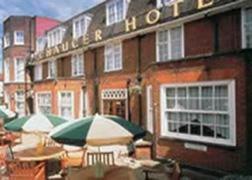 Hotels in Canterbury: Swallow Chaucer Hotel - Hotel, 63 Ivy Lane, Canterbury CT1 1TU.